Throughout the fall, each cottage has a fundraiser. Some have a bake sale, some cottages create jewelry; recently, a cottage hosted a karaoke night! These sales and events all benefit a student-chosen charity. 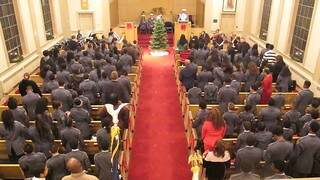 Before winter break in December, Glenwood Academy celebrates the holidays with a dinner and a pledge service. Invited guests join students at dinner to mix and mingle. Once at the Oliver Burton Chapel, students give their donations to the chosen charities, reaffirming Glenwood's teachings of giving back to the community. This is a ticketed event. Please contact Jen Wolff at jwolff@glenwoodacademy.org or 708-756-6496 for general inquiries.